The Vietnamese Yem nguyệt đao is closely related to the Chinese yanyuedao (偃月刀), and the Korean woldo (월도). The defining feature of the type is a wide blade with upswept tip, and a spike at the back of the blade. Often, the area at the back from spike to tip is serrated or scalloped. The weapon first appears in the Chinese Wujing Zongyao (武經總要), a military treatise dating from the 11th century. Today it is mostly known in Chinese martial arts circles as a "Guandao". Read all about that attribution in my article describing a Chinese yanyuedao blade. Blade thickness: 8 mm at base, 3 mm middle, 2.5 mm at tip. Blade width: 60 mm at base, 83 mm middle, 136 mm widest. A rare example of a Vietnamese Yem nguyệt đao . 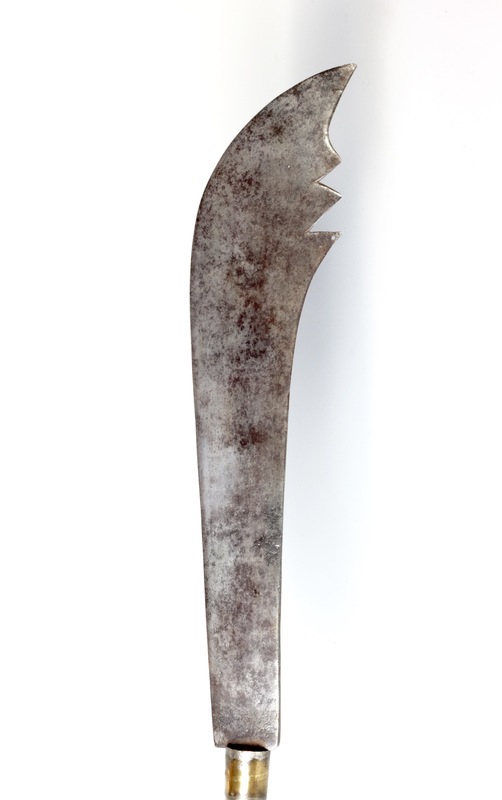 Its tanged blade with characteristic hook at the back, followed by and serrated / scalloped section leading to the tip. The blade widens considerably near the tip, where it edge sweeps up, making it an effective cutter. It is mounted on its original thick wooden shaft, lacquered black. The shaft has warped a little over the years, see pictures. 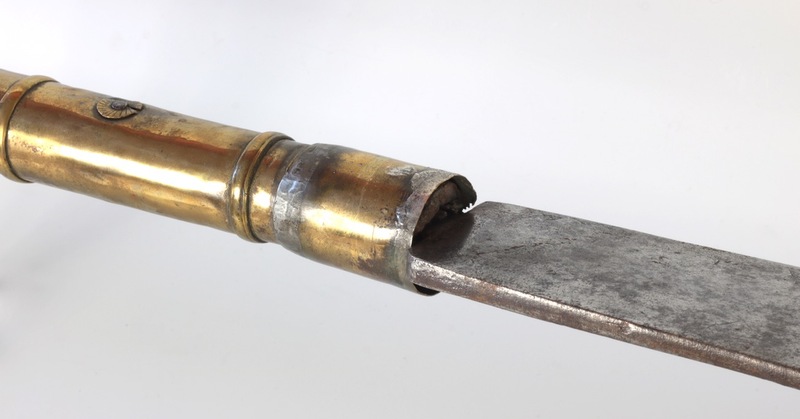 The upper section of the shaft is covered with a ribbed brass sleeve, with ornamental cutouts at the bottom. This is a defining feature for Vietnamese pole-arms. At the top is a secondary sleeve, just under the shoulders of the blade. It's probably to prevent the main sleeve from splitting. Two rivets go through the shaft, holding the tang. 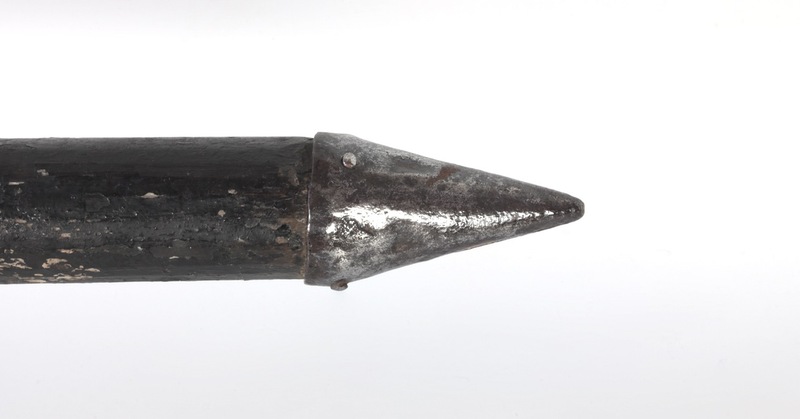 At the end of the shaft is a triangular iron spike. 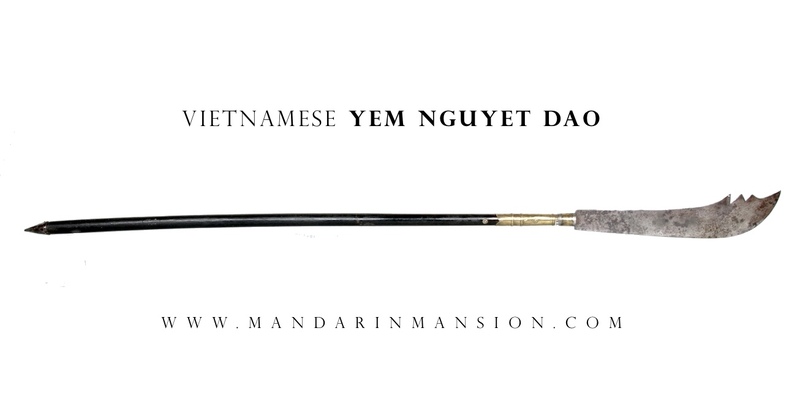 A rare example of a Vietnamese yem nguyệt đao , a close relative to the Chinese yanyuedao , retaining its original shaft.